Asanas' in Sanskrit means posture. There are around 84 asanas - each one has a special name, special form and a distinct way of performing.ń Asanas are designed to promote, a state of mental and physical well-being or good health. This may be defined as the condition that is experienced when all the organs function effectively under the intelligent control of the mind. Asanas have an extraordinary capacity to overhaul, rejuvenate and bring the entire system into a state of balance. Swami Ramdev has advocated the follwing seven Aasans to be performed with Pranayama for maximum benefit. Mandukasana : Sitting in Vajrasana pose, place the left palm on the right palm and keeping them on the navel and press the stomach inwards and while exhaling bend forwards like Mandukasana. Repeat this position 3 to 4 times. Shashankasana : Sit in Vajrasana. Inhale and raise your arms above your head. Exhaling bend forward from your waist and keep your palms on the floor. Your abdomen must be pressing against the thighs and your buttocks must be resting on your heels. Markatasana : Lie down straight and spread the hands at the shoulders level. The palms should open towards the sky. Then fold both the legs up to the knees and keep them near the hips. Now turning the knees toward rihgt side, rest the right knee on the ground. Left knee should rest o the right knee and the left ankle should rest on the right ankle. Turn the neck to the left side. Pavanmuktasana : Lie flat on the back in the shava-asana. Inhale and bend the right knee and pull it close to the torso with both hands while interlocking the fingers just below the knee. Keep the left leg flat on the floor. Hold the inhaled breath for a few seconds then exhale slowly through the nostrils and lift the back, shoulders and head off the floor and touch the knee with the forehead. Shalbhasana : Lie on the ground with the face downwards and both hands under the chest touching the ground with the palms of the hands and both legs raised in the air ten inches high. Regular practice of the pose can get rid of a bulging tummy. Edema of ankles and feet can be treated with Shalabahsana. 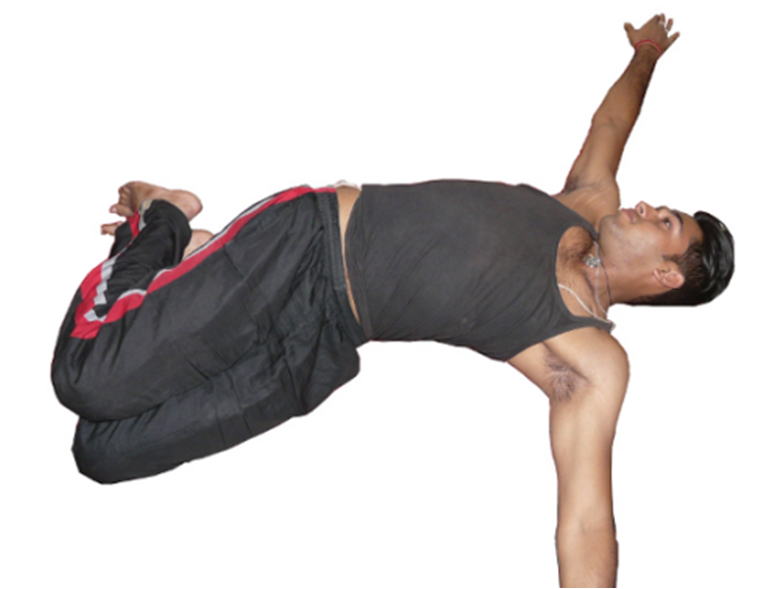 Makarasana : Lie prone, the chest should touch the ground and both the legs stretched out. Hold the head with both the arms. This is Makarasana that increases the heat of the body. Wonders of Pranayama ! : How Pranayama Works ? Copyright © 2014 Atmabodh; Self Reailsation. .